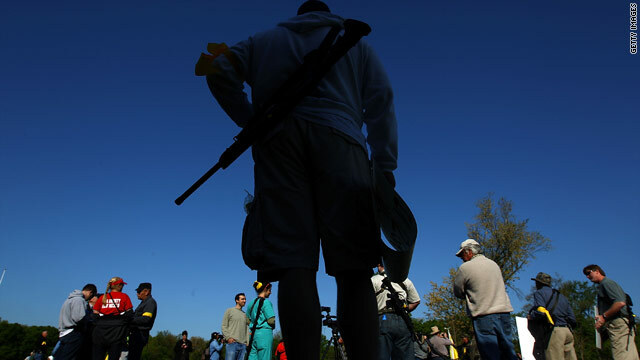 Gun rights groups gather at Fort Hunt Park for an 'Open Carry Rally' April 19 in Alexandria, Virginia. Protesters able to carry weapons in "Open Carry Rally" in Virginia; not in D.C.
Washington (CNN) -- They're angry at the government and are demonstrating in the Washington area against what they see as the trampling of the Constitution. Their specific fear: Americans' right to bear arms under the Second Amendment will be taken away. "We're in a war. The other side knows they are at war, because they started it," said Larry Pratt, president of the Gun Owners of America. "They are coming for our freedom, for our money, for our kids, for our property. They are coming for everything because they are a bunch of socialists." Pratt was one of the speakers at the Second Amendment March in Washington on Monday. The crowd -- made up almost entirely of men -- used language about war and fighting. But when pressed, they were quick to point out they don't mean actual armed violence. Pratt said they'll be able to get rid of their opponents and "get some fighters," election fighters. "That's why we have some primaries this year, and we need to send them a message that we are coming for the Republican RINOS [Republicans In Name Only], not just the Democrats ... that's the second event in November," he said, referring to midterm elections. Rep. Paul Broun, R-Georgia, said "we must declare war against oppression and against socialism, and you are the people to do that." Cathy McNickle of Virginia said it was important to take time off of work to "listen to these people and support the cause." For those rallying, it's not just fear of losing their Second Amendment rights, but also dissatisfaction with the political climate in Washington. "I'm not real happy with the direction the government's going in right now, and I believe that our Second Amendment rights are in trouble, with the political atmosphere that's in Washington right now," said Alan Addington of North Carolina. Across the Potomac River, in Virginia, another group of protesters are defending the Second Amendment with a show of arms -- holding an "Open Carry Rally." Signs in the crowd pointed to the role of government, with one reading, "My rights come from God, not from the government." Protesters had large rifles and other weapons strapped to their bodies. Restore the Constitution Rally event organizers said they chose certain areas in Virginia -- like Gravelly Point Park and Fort Hunt Park -- because they are "firearms carry-legal [locations] as close to D.C. as possible." In Virginia, it is legal to openly carry certain weapons. But it is illegal to openly carry a weapon in the District of Columbia. Opponents say that gun rights advocates' worries are unfounded; that there are no proposals coming from the White House or Democratic leaders in Congress for new major gun control laws. Monday's events come on the anniversary of the battles at Lexington and Concord in the Revolutionary War, when the British moved to seize colonists' supplies. It's a point protesters say is the impetus for their call to action. "This was one of the first displays of American spirit as the colonists united to defend their way of life," according to the Second Amendment March Web site. April 19 also is the 15th anniversary of the Oklahoma City bombing. It's a connection one speaker was adamant to get away from. "They want to make this about [convicted Oklahoma City bomber] Timothy McVeigh, which really pissed me off," radio personality Erich "Mancow" Muller said at the Washington rally. "How about mentioning that this is patriot's day?" The anger at the government -- and specifically the Obama administration -- has been rising over the past year, and has been visible in the rise of the Tea Party movement, at health care reform rallies and with other protesters. One group, Oath Keepers, said its allegiance is to the Constitution and not the president. The group's founder, Stewart Rhodes, a former Army paratrooper and staffer for GOP Rep. Ron Paul, said his members recite a revised version of the oath that's used for enlistment in the armed services. However, they exclude the phrase, "I will obey the orders of the president of the United States." "Our role is not to be obedient to who happens to be the leader," he said. "Our role is to defend the Constitution and the republic." The Oath Keepers call on members to disobey any orders, as they put it, "to disarm the American people" or "to force citizens into detention camps." It's a pledge Rhodes recites in an anti-Obama DVD called "Fall of the Republic." Mark Potok of the Southern Poverty Law Center said the Oath Keepers are exploiting false rumors found on fringe Web sites. "Many of the Oath Keepers are people who believe that martial law is about to be imposed at any moment. It is right around the corner," he said. But Rhodes said his group is not anti-government and not anti-Obama. So, who's talking about taking guns away? "So, we have to wait until someone talks about it before we can say we won't do it?" he said. CNN's Jim Acosta and Paul Courson contributed to this report.